iPad Air vs iPhone 5s: iSight and FaceTime camera shootout! From general photography to low light scenes to macro and back, how does the iPad Air iSight camera compare to the iPhone 5s? While the iPad Air now has the same, improved front-facing FaceTime HD camera as the iPhone 5s - and every other 2013 iOS device - its rear-facing iSight camera remains very much unchanged from the iPad 4 and original iPad mini. What has changed however is the software and hardware that power it. With iOS 7 and the very same Apple A7 found in the iPhone 5s - and the very same image signal processor (ISP) - the iPad Air could see an overall boost in quality anyway. To measure how it stacks up, we put the 5 megapixel iPad Air camera up against the 8 megapixel camera, not see if it would win - it doesn't have a chance - but to see how close it can come! The original iPad had no cameras. None. The iPad 2 had both iSight and FaceTime cameras at VGA resolution, which is only barely better than not having any at all. 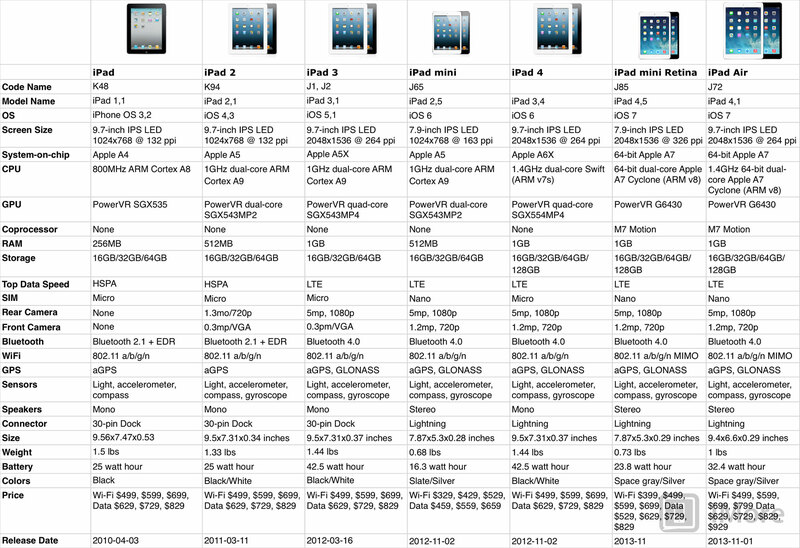 The iPad 3 and iPad 4 both had 5 megapixel cameras, but Apple A5X and Apple A6X processors behind them respectively. Better, but not outstanding. The iPad Air does nothing to improve the glass, so any differences here will come purely down to the A7 chipset. Unless otherwise specified, I used default settings for every picture, meaning I used the iSight Camera right out of the box. I also did not manually focus on anything, I let the software do all the work and balance images the way it saw it. I think this gives a better overall picture of how the software and hardware work together. The only thing I did enable on both devices were grid lines to help me try and get the exact same shot each time. When it comes to general everyday photography, I found both the iPad Air and iPhone 5s completely capable of getting the job done. If you have any recent iPhone, it'll be better than any recent iPad, of course, but some people only have an iPad, or only have an iPad handy when it matters. If that's the case, you won't have any issues with the iPad Air. It manages to balance light better than its predecessors and for the most part, keeps pace with the iPhone 5s fairly well. It's a great example of how software and hardware working together can make a decent different in image quality. For these macro shots, I had nothing enabled and let both the iPad Air and the iPhone 5s focus all on their own. Overall, both did an amazing job with closeup photography. The one thing that stood out to me was that the iPhone 5s appears to be better at balancing colors. A good example of this is the photo of the ivy and leaves growing on the brick. If you take a look at the sidewalk in the lower right, the iPhone 5s did a much better job of showing natural colors. Here only setting I enabled on either camera was high dynamic range (HDR). Every other setting was either disabled or default. Again, I left the iPad Air and iPhone 5s to focus themselves. Overall, both cameras did a nice job of capturing HDR photos and did a good job balancing light and dark portions. T iPhone 5s results better captured what was in front of me. The very last picture may look as if the iPad Air came out ahead but in reality, the shadows produced on the grass by the iPhone 5s were a better approximation of what I was actually looking at. It's almost as if the iPad Air over-compensated in some areas. Either way, the iPhone 5s came out ahead, but only by a hair. I didn't have to take very many shots to realize that the iPad Air suffers from a lot of noise in low light conditions. A lot of noise. This isn't much different than previous generations of iPads. It just doesn't have the same quality sensor the iPhone 5s enjoys, nor does it have an LED Flash to help compensate if it needs to. But that's the way it is. If you're planning on taking a lot of low light photos, the iPad Air won't be a good go-to camera for you. Both the iPhone 5s and iPad Air FaceTime cameras struggle in bright light. In regular lighting conditions however, they both faired pretty well. The iPhone 5s pulls ahead slightly because it seems to balance skin tones a bit better than the iPad Air. Either way, if you're into selfies, the iPad Air should do an okay job as long as you have normal lighting conditions. When it comes to video quality, both the iPhone 5s and iPad Air are capable of shooting in 1080p, and overall, they both do a great job . The iPhone 5s seems to be quite a bit more sensitive to noise than the iPad Air and I'm not sure if that's a good or a bad thing? If you need to pick up quieter sounds, the iPhone 5s will fair better. Video quality in general seemed to be on par but the iPhone 5s auto-balances light somewhat better. In normal lighting conditions anyway. When it comes to everyday photography, you won't be disappointed in the iPad Air. Even the video quality is pretty great. If low light is important to you, you'll have problems, however. If you don't have an iPhone, another make of camera phone, or even a point-and-shoot camera, you can absolutely get by with an iPad Air. It's not the best camera in mobile, but if it's all you have with you, it's good enough. If you picked up an iPad Air, let us know what your overall experiences have been with photo and video quality!